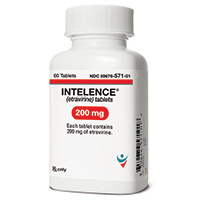 The FDA has approved a 200mg dosage strength of Intelence (etravirine tablets, from Tibotec), a non-nucleoside reverse transcriptase inhibitor (NNRTI) indicated for the treatment of HIV-1 in treatment-experienced adults with resistance to an NNRTI and other antiretroviral agents. This approval was based on clinical data from the DUET studies which evaluated the efficacy of Intelence 200mg twice daily compared to placebo in combination with other ARV agents in adult treatment-experienced HIV-1 patients with documented resistance to NNRTIs and protease inhibitors (PIs). Intelence 200mg tablets are expected to be available later this month. Intelence is already available in a 100mg dosage strength tablet. For more information call (877) 732-2488 or visit www.intelence-info.com.